Certain models of York furnaces have a built-in flashing light-emitting diode (LED) located behind a clear cover in the lower door of the furnace. This LED flashes a fault code in a series of green, amber or red light flashes to signal normal operation or system problems. The flashes occur in ¼-second intervals with a two second pause in between; for example, a two-flash code will flash on and off twice, stay off for two seconds, then repeat. 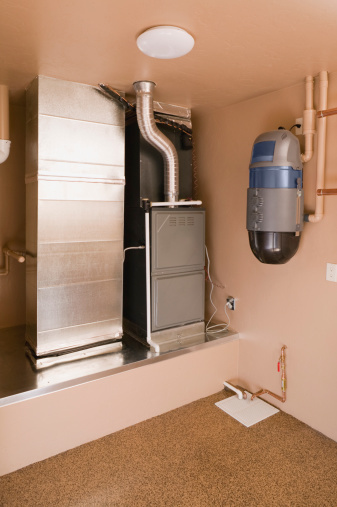 If your furnace self-diagnoses a problem and flashes a code other than those of normal operation, contact a qualified service technician to repair the system. One green flash signals normal operation with no call for heat, meaning the thermostat is not currently telling the furnace to produce heat. Two green flashes and three green flashes may appear after attempting to retrieve any stored error codes, and both signal that there are no error codes stored in the memory system. A rapid green flash is only used during factory testing. If this code occurs, turn the furnace off and then back on. One amber flash signals normal operation with a call for cooling, meaning the wall thermostat is currently telling the furnace to cool. Two amber flashes signal normal operation with a call for heat, meaning the wall thermostat is currently telling the furnace to produce heat. Three amber flashes signal normal operation. The wall thermostat temperature has been fulfilled, and the furnace burner is ending its cycle. Four amber flashes signal that there may be a restriction in the circulating air system that is reducing the heating capability of the furnace. Five amber flashes signal a restriction in the vent or combustion air system that is reducing the heating capability of the furnace. A rapid amber flash signals a possible low flame. A common cause for this error code is a dirty or incorrectly positioned low flame sensor rod. One red flash signals that a flame is present but that no power is being supplied to the gas valve. Possible causes for this might be a gas valve that is leaking gas to the burner or that is closing too slowly. Two red flashes signal the pressure switch is stuck in the closed position. Possible causes include incorrect pressure switch wiring or a faulty pressure switch. Three red flashes indicate the pressure switch is stuck in the open position. Possible causes include blocked vent pipes, blocked air intake pipes, faulty pressure switch or pressure switch hose or a faulty combustion air blower. Four red flashes indicate that a 24-volt fuse or the high-limit switch is open. Possible causes include an improperly sized ducting system, a dirty air filter, a faulty blower motor, an open fuse on the control board or restricted circulating airflow. Five red flashes signal that an auxiliary limit switch or a rollout switch is open. The rollout switch (on the side of the burner box) is a manual reset switch and you reset it by pressing the button in the center. Six red flashes indicate a current failure on the modulating gas valve. Seven red flashes indicate the furnace has entered lockout mode because of no ignition. The furnace control will attempt to ignite the flame three times, and if unsuccessful it locks out for an hour before retrying.